Transportation Secretary Elaine Chao will maintain the national conversation on infrastructure funding with a pair of high-profile events next week. Chao is scheduled to deliver keynote remarks Feb. 28 at the American Association of State Highway and Transportation Officials’ legislative meeting in Washington. AASHTO Executive Director Bud Wright will introduce the secretary, and her address will follow a panel discussion featuring the chairmen and ranking members of the surface transportation committees in the U.S. House and Senate. 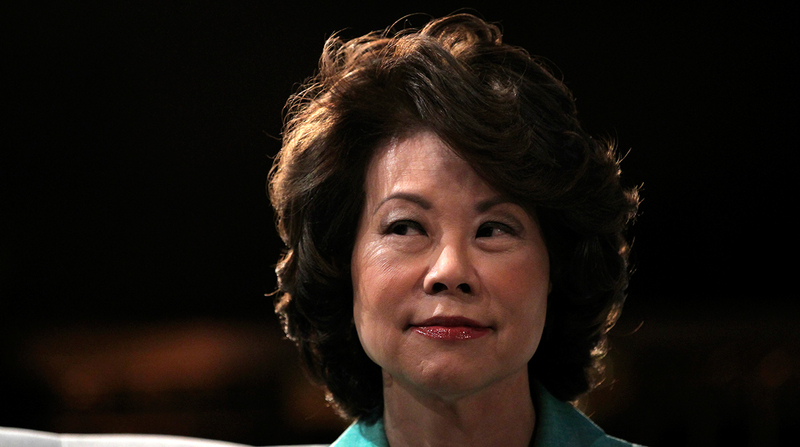 On March 1, Chao is scheduled to brief the senators of the Environment and Public Works Committee who have expressed enthusiasm for President Donald Trump’s $200 billion infrastructure “principles” pitch to Congress. Trump met with congressional transportation leaders on Feb. 14, and EPW ranking Democrat Tom Carper of Delaware said the president backed an increase of the fuel tax. Key freight stakeholders, such as the U.S. Chamber of Commerce and American Trucking Associations, have called on lawmakers to support an increase in federal fuel taxes. Opposition, however, stems primarily from Republican leaders who also have not indicated when they plan to advance an infrastructure bill. The White House’s funding “principles” unveiled Feb. 12 would rely significantly on nonfederal funds to reach a $1.5 trillion top line over 10 years. Governors would be allowed to apply for grants for rural projects. Federal fuel taxes, which are used for the Highway Trust Fund, have not increased since 1993. The account assists states with maintenance and construction projects.